The Natalie Outdoor Lounge Chair in White is a beautiful and fun chair made of a combination of long-lasting outdoor materials, including steel and Aluminum (both powder-coated) and Ecolene® synthetic outdoor wicker. 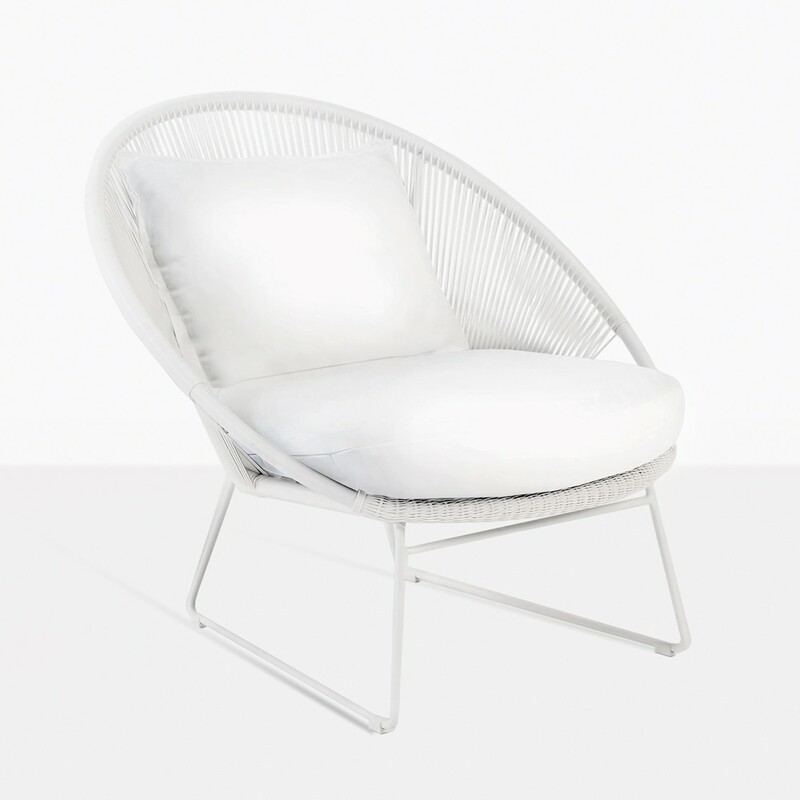 Relax away all your problems with the new Natalie Outdoor Lounge Chair in White – part of the fresh, range of Ecolene® Wicker exterior pieces at Design Warehouse. Mid Century in style; the Natalie Outdoor Lounge Chair in White is low and glamorous. The frame a beautiful, rounded shape sitting on a sturdy feet. Elegant white colored tubing in robust Ecolene® is wrapped around creating a delightful nest like effect. 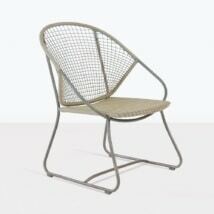 The Natalie Outdoor Lounge Chair in White is ideal size for a modest space; at 34 by 36 inches and 32 inches high. Place it alongside your pool side or over an ocean view and let yourself breath easy in the Natalie Outdoor Lounge Chair in White. 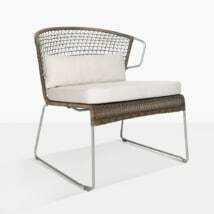 Constructed out of strong, marine grade materials, the Natalie Outdoor Lounge Chair in White is built on a powder coated aluminium and steel frame with our new brand of Ecolene® Wicker a hot on the scene polyethylene synthetic fabric, which is through-dyed and UV treated, ensuring it can handle the changing elements. Ecolene® is strong, attractive and feels amazing. If that weren’t enough, you’ll be happy to know that Ecolene® is an eco-friendly! Making it that much more desirable to be part of your outdoor living area! At Teak Warehouse we have everything to cover the bases and more for design, style and functionality of ‘living’ outdoors. Alongside Ecolene®, we also supply Rehau® and award-winning Viro® All Weather Wicker. Our products started with A-Grade Teak and expanded to many other marine grade products. Investigate our Raw Concrete composites, #316 Stainless Steel, Reclaimed Teak, Batyline® and Textilene® mesh and Sunbrella® fabrics. Create an outside living room with our unique deep seating, dine in style with our tables and chairs, umbrellas and planters will adorn your patio and relaxing chairs, like the Natalie Outdoor Lounge Chair in White will keep you comfortable and divine your outdoors with its unique style. Teak Warehouse is proud to supply outdoor furniture nationwide, so whether its for the home or a commercial business, contact us today! We are happy to put together a comprehensive quote for you that factors in shipping. These materials mean you’re buying a chair that will last a very long time and envelop you in comfort for many years while proving to be a timelessly styled piece of outdoor furniture. No doubt the relaxation benefits of this outdoor lounge chair will have you putting it into full-time use as a relaxing chair and willing to reallocate it to different spaces as style needs or the mood dictates. The Natalie Outdoor Lounge Chair in White offers you a brilliant contrast of bold colors, unavailable in other outdoor wicker lines, generally speaking. The Ecolene® line is known for a vibrant and fun color palette of spectacular outdoor capable fibers. Place a couple of the Natalie Outdoor Lounge Chair in White on your lovely veranda facing the view, a low accent table in between… the perfect area for you to catch up with a loved one over a glass of wine in the luxury of your surroundings. The Natalie Outdoor Lounge Chair in White also makes for a fantastic indoor chair – situate in your sun room for a modern edge in your classic space. 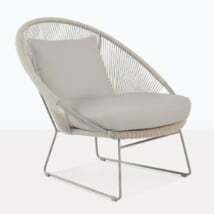 The Natalie Outdoor Lounge Chair in White is a stunning, beautifully designed piece of furniture. Purchase yours today!